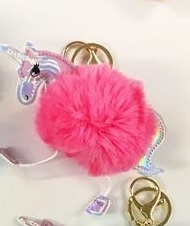 These unicorn pompom key rings are full of fun, fur and fluff and are a perfect to attach to your keys so that they will never be lost again at the bottom of your bag or to add a little bit of style to your school bags or handbag. Pompoms are the height of fashion at the moment and these are certainly a 'must have now!' accessory. A large fluffy pompom measuring approx 10cm in width has a metal key ring which works as a clip mechanism in gold allowing you to 'pompom up' and jazz up any bag, zip, purse, rucksack.... there are plenty of possibilities!. They have a hologram effect unicorn head, legs and tail. This makes a fabulous, unique gift for a friend or loved one and aren't just for adults - the 'little team' at Candy Bows have been pompom-ing their own bags!